In recent months Encompass has been delighted to sponsor a number of legal industry conferences including ALPMA (Australasian Legal Practice Managers Association) in Melbourne and the LawTech Summit and Awards on the Gold Coast. 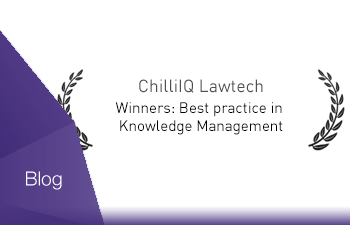 It was at the latter where we were thrilled to see one of our many legal clients, HWL Ebsworth, win ‘Best Practice in Knowledge Management’ recognising their effective use of our visualisation technology to manage commercial information in their firm. As stated in their nomination, advising clients on commercial transactions, HWL Ebsworth is required to complete due diligence on properties, companies and individuals, which can be tedious and slow. Using Encompass has enabled the firm to improve the efficiency and accuracy of their commercial search and review, particularly when it comes to PPSR information. They can now finalise due diligence quickly, provide prompt advice and minimise risk. The formalisation of Encompass as the ‘best practice’ standard in working with commercial information is extremely rewarding for all of the team at Encompass. The dramatic improvements in productivity and client value that Encompass delivers have been welcomed by many in the industry along our journey, including Encompass’ Industry Advisor and Editor of the Lexis Nexis Banking and Finance Law Bulletin Karen Lee, who says “Apart from using electronic PDFs instead of pieces of paper, the way firms buy and interpret commercial information such as ASIC reports and Land Titles records really hadn’t changed much in the last 20 years”. This was certainly the basis of the opportunity Encompass saw when we began building our solution more than 2 years ago. So what does all this mean for Australian law firms and other professionals who rely on quickly and accurately understanding commercial information to deliver their core services? Keeping up with best practice standards in information management will be critical to remaining competitive and using visualisation technology like Encompass to enable more effective search, review and management of commercial information is now the norm.